Our 2019 spring Seeds to Starts workshops are complete – stay tuned for our fall seed starting workshops beginning this summer. In this two part workshop, we start many of the vegetables and herbs we use in our gardens. Join us for one or both parts to learn how to start growing your own vegetables from seed AND help Austinites in need get access to nutritious affordable food. 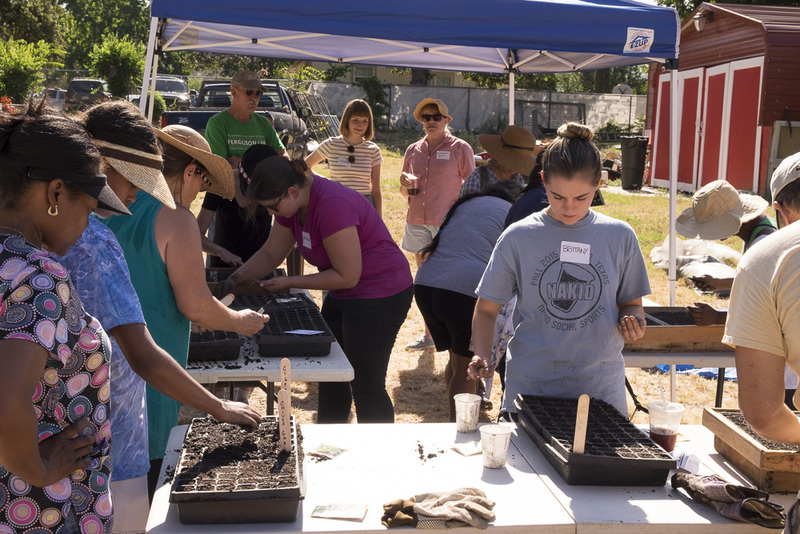 At these hands-on workshops, participants learn how to prepare soil for seeds, how to plant seeds, and how to transfer seedlings into starter pots. GCP uses the starter plants produced in these workshops in our gardens and you’ll be able to take some home. In Part 1, we’ll start our seeds in flats and trays and in Part 2, we’ll bump them to individual 4 inch pots. Note that the two workshops are independent – you can attend either one individually or if you like, both. No gardening experience is needed, just dress appropriately for the weather and bring a water bottle. Please be sure to check your e-mail both the night before and the morning of the workshop as it is possible that we may need to reschedule because of weather or other reasons. For the workshop, be prepared to be outside and bring water and protection from the weather. We will meet at 1210 Rosewood Avenue. Please arrive by 8:45am so that we can start promptly at 9am. We will assemble outside in the area behind the building. There is not a sign out front that says “Green Corn Project”, so look for a sign for Rawsome. This map and photo should help you find us. If you come by car, there is limited parking in back and additional parking in the surrounding neighborhood. If you park in the lot, please use caution when entering. If you bicycle, there is a bicycle rack on the east side of the building you can lock your bike to. Please do not chain your bicycle to the entrance ramp rails at the front or back entrances, as this can block access.